We have ten modern housekeeping lakeside cabins, all have a great lake view and are air conditioned. Living room areas feature a futon and easy chairs. The kitchens have a coffee maker, microwave oven, toaster, full-size refrigerator, stove, crockpot, hand electric mixer and are completely equipped for housekeeping with glasses, dishes, utensils, pots and pans. Cabin 1 and 10 have an electric griddle. Cabin 10 also has an electric frypan. Electric griddle and electric frypan are available at the store for checkout. All bathrooms have a shower or tub/shower, toilet and sink. Cabins are furnished with toilet paper and one roll of paper towels. Guests must furnish their own bath and kitchen towels, washcloths, dishrags, soaps, lawn chairs, etc. Each cabin has a 22" charcoal grill, picnic table, trash can, and fire ring. One boat is provided with each cabin, or you may exchange it for dock space for your boat. Can’t stay for a full week? After April 1 you can book a minimum three night stay from May 29 to August 19. Please call for details. Stay 5 nights - 6th and 7th nights are free! Weekly reservations run from Saturday to Saturday. All rates are based on occupancy. Max. Occ. * - Extra persons (any age) are $30.00 per night or $150.00 per week. Nightly stays are for a three night minimum. Minnesota Sales Tax extra on all rates.—No refunds for early departure. Northern Lights Resort has been in operation since 1946. Started out as a small resort with 3 cabins basically for fishing. Dead Lake is known for great fishing for walleyes, northern, bass, crappie and sunfish. 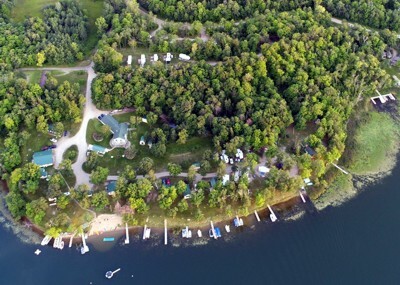 Since then it has grown to 10 cabins, 4 lakeside campsites, 4 lakeview campsites and 11 seasonal campsites. The cabins are from 2 bedrooms to 4 bedrooms. The resort is open year round for your enjoyment of all the outdoor activities that Minnesota has to offer. We have a great sandy beach for many toys to use. Fishing is good throughout the whole lake and even off our docks. From I-94, go to Ashby exit. Take Hwy 78 north to County Road 14 West. Follow CR14W through Richville and out to Dead Lake. Follow the signs to Northern Lights Resort. From Nebraska, Western Iowa and South Dakota, take I-29 north to Wahpeton, ND. Take 210 E to Fergus Falls, MN. Take County Road 1 East to County Road 14 (Richville sign). Stay on CR14 for about 5 miles. Follow the signs to Northern Lights Resort.